The first pirate attacks. Kyril’s health plummets. Next pirate’s turn. I grit my teeth – only to watch, impressed, as the boy’s father leaps in to protect him from the blow. Kyril took only half damage from that hit, and the pirates’ opportunity has passed. It’s Andarc the mage’s turn next, and he opens up with a barrage from his Lightning rune, killing one pirate and wounding another. Then it’s the turn of more and more of my characters, and as they run up to join Kyril, the danger is past. 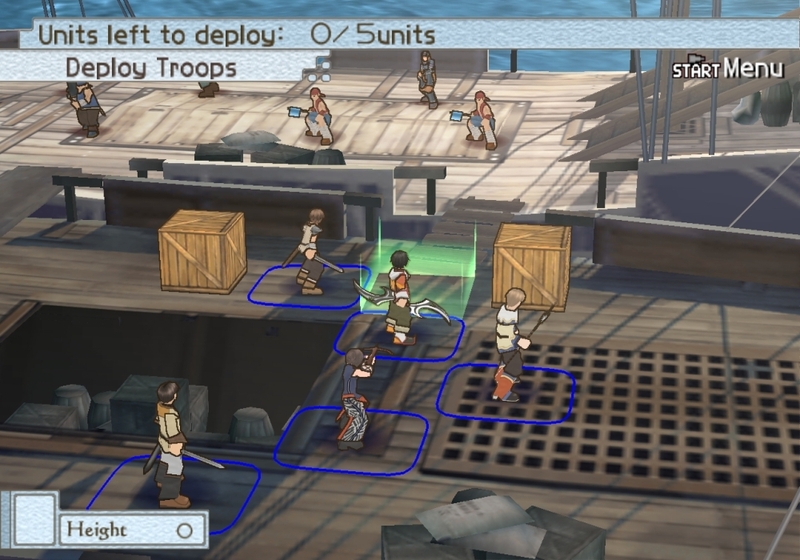 I’m several hours into Suikoden Tactics, a 2005 spinoff from one of my favourite RPG series, Suikoden. As its name suggests, it’s a grid- and turn-based tactical RPG in the vein of Final Fantasy Tactics, Tactics Ogre, and Disgaea (in other words, in my classification scheme, it’s a Type III game). From a mechanical standpoint, it is reasonably straightforward: different characters have different strengths and weaknesses, and while characters’ classes appear to be effectively preset – for instance, Kyril will always be a melee fighter – there is some scope to customise them by choosing which skills to prioritise. The actual combat is standard TRPG fare, though with a couple of quirks: characters have elemental affinities with particular tiles on the map, and tile elements can be changed by items and spells. That said, so far this seems to be good standard TRPG fare. Combat feels intuitively fluid in the way that the best tactical RPGs do: characters go down in just the right number of hits (too many would lead to tedium; too few would be frustrating), move far enough for squishy characters to be vulnerable, but not too vulnerable; and so on. Aesthetics are a mixed bag; the in-game sprites have not aged well, but character portraits are crisp and attractive. Storywise, no spoilers, but I’m definitely intrigued. This would already be enough for ST to strike me as a good, competent tactical RPG, but on top of that, it contains several little touches that add up. First is UI. You know the little cursor dance you do in every TRPG, when you want to check whom the active character will be able to hit from a given tile, how much damage s/he will inflict, etc? ST addresses that with one of the few big interface improvements to hit the genre: when you move, little icons will pop up over (a) enemies you can target, (b) enemies you can kill outright, (c) allies you can heal, etc. Why can’t more games do the same? Second, ST also contains the Suikoden series’ hallmark integration between gameplay and story. Characters on good terms can boost each other’s defence (as I chronicled above), I’ve seen at least one character get the “Berserk” status when a loved one was injured, and more. That’s not earth-shattering; but it is a nice touch, and again, why can’t more games do the same? Last but not least, there’s the context in which I’m playing ST. Maybe in 2005, a console tactical RPG needed to be more than “good and competent” to stand out, but not in 2013. They, very literally, do not make games like this any more: the Suikoden franchise is effectively dead (1), and Japanese tactical RPGs have migrated from home to portable consoles (2). So when I first slipped the ST disc into my PS2, it felt like a reunion with a long-lost friend (down to the comfortingly familiar genre conventions). Will this game turn out to be one of my all-time favourites, like FFT and Tactics Ogre? So far, it’s too soon to say, especially as that will probably come down to the story. But I am pleased to report that at this point, Suikoden Tactics is exactly what I hoped for when I bought it. Any Suikoden or TRPG fans looking for a vintage fix could do a lot worse than check it out. (1) The most recent Suikoden game (2012) wasn’t even translated into English, the one before that (2008) was panned, and the one before that, the excellent Suikoden V, dates all the way back to 2006. (2) Exemplified by Valkyria Chronicles moving from PS3 to PSP after the first game, and by Tactics Ogre’s release on PSP. The last notable console tactical RPG I can recall is Disgaea 4 (2011). Next Next post: Be part of my Europa Universalis IV / Paradox Dev’t Studio Q&A!